Although we have spent most of our time in the car lately, we decided to hit the road for a mini-journey to South Padre Island and do a little exploring. So with canine team in tow, we made a weekend out of it. Our trip was mostly to explore the real estate market down here, and let me tell you we are definitely not in California anymore ( read: affordable!) . But I will leave that discussion for another day. We left on Friday night and since both of us had never been to SPI before we had no idea what to expect. 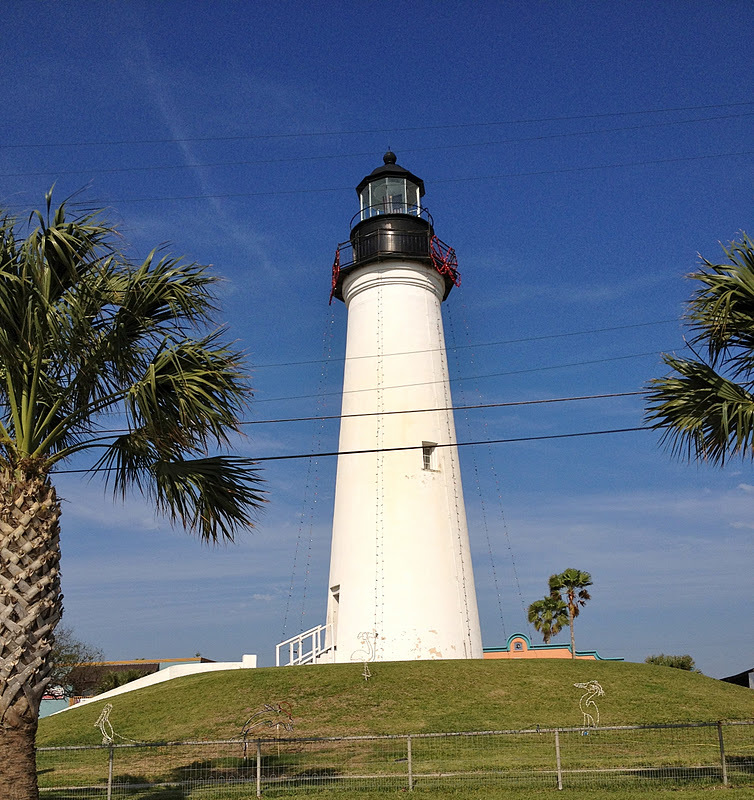 As you approach the island, you will find the Port Isabel Lighhouse which is open to tourists for climbing. We will definitely have to check this out later and check out the panoramic view of SPI and the surrounding area. On Saturday we were able to take in the view to the island and it was super pretty. This is the Queen Isabella Bridge that connects SPI to the "mainland." We found this lovely statue of "Cristo de los Pescadores" Christ of the Fisherman and it was a stunning addition to the coastline. From what I understand this maritime statue is supposed to symbolize Christ blessing the fisherman that have been lost at sea. At the base you will find the names of some of those lost fisherman. 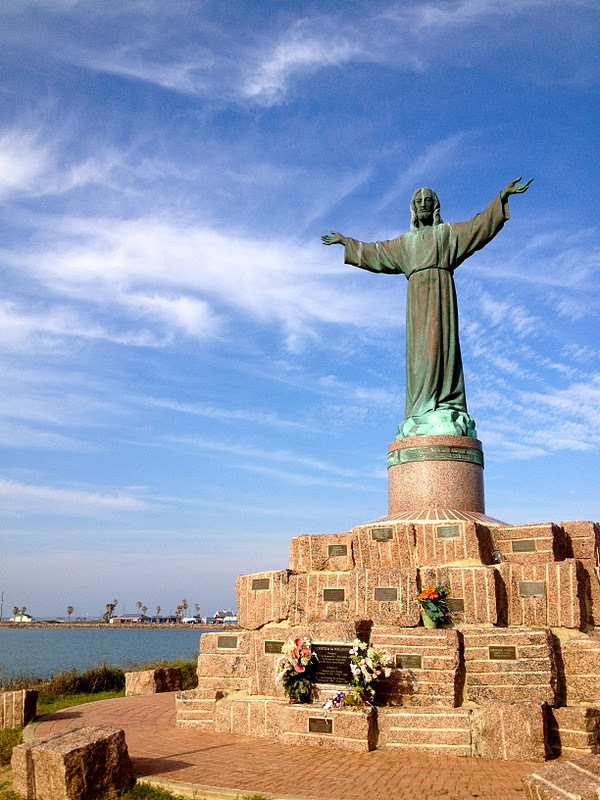 The statue is located at the entrance of Isla Blanca County park on South Padre. Our Sunday morning walk on the beach was just lovely, there were many sweet shells in the sand and the water was beautiful. Apparently this part of the island is one of the best and also a great place to fish. I anticipate B might be headed here soon for some spear fishing. We had to head back and leave this lovely island but I am certain we will be back time and time again. Like I mentioned, we spent most of the time looking at casitas and villas but soon we will be back to take in more of the sights. There are many places to stay here, motels, condos, RV parks etc. We stayed in a budget and pet friendly motel and paid about 75 bucks for the weekend. Right now is a great time to visit because it is very calm and all the "Winter Texans" are here enjoying the sun. Even though this island is mostly known for the crazyness of Spring Breakers, it certainly has so much more to offer. I was happily surprised to run into an international crowd that even had me practicing my French. It seems many people make this a second home to avoid the chilly winter temps. I'm hoping to get back to regular blogging soon, but it's been a little bit like camping for us lately. Our belongings are still in transit from Cali. I look forward to the delivery but not to the unpacking! Still, I hope to set some sort of routine for my new life here but I know it will take some time. So bear with me! i'm glad you found some salt water and shells laura! I love exploring beaches in real and virtually! You must be happy being in a warmer climate now!! I have been there once. Someday you should drive up to Brownsville and visit their little zoo. The Gibbons are fun to watch. I wore my fur today but exchanged it out at lunch because we are supposed to get snow this evening. Seems there are some neat things to do in the town of South Padre Island. Winter Texans, yes, they have arrived. All the way from SPI to Rockport and beyond. We took Doxy to the island yesterday for beach play time. There was some old "evidence" of the deadly red tide, but the danger has passed and we can enjoy these beaches again. You just missed it, lucky you! Hola, my fellow Texan! yes, it such a lovely place. It's weird sometimes to think Texas has great beaches but there here! And of course, I love all the history of the islands. So, glad you are getting out to enjoy the texas island! oh I want to go! The sky looks so blue there! Great photos. Looks like beautiful scenery.